Valley Isle Resort #401 Oceanfront! These condominiums are located on a fabulous piece of paradise, on the beach less than 150 feet from the ocean's soothing waves. Fall asleep to the sounds of the ocean. Step out onto your own private lanai for a cup of coffee or a glass of wine. In the winter months, you will be able to watch the humpback whales playing in the ocean. Part of the daily routine is to watch the sunset from the lanai's or the beach. Swim in the beautiful pool which is surrounded by tropical gardens. You can also barbecue next to the pool. Maui, also called the Valley Isle, has the potential to offer visitors dreamlike, even surreal, experiences: floating weightless in a rainbowed sea of tropical fish, standing on top of a 10,000 foot volcano, watching the sunshine color the sky, or listening to the raindrops in a bamboo forest. Maui is really just a casual collection of small towns with a slow, peaceful way of life where car horns are only used to greet friends and posted store hours mean nothing if the surf is up. My husband Paul, our two Umbrella Parrots and two kitties love Maui. You will find us either on Maui or in San Diego but same contact info either way. 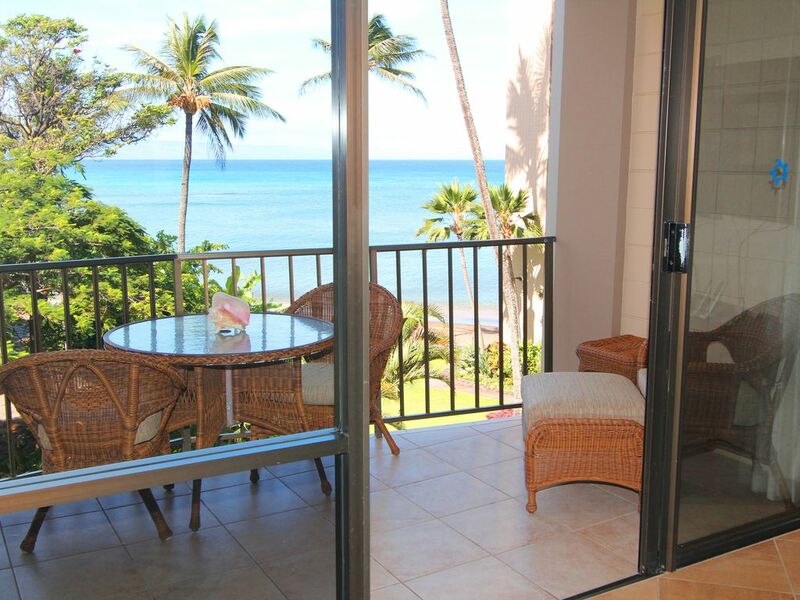 Valley Isle Resort Condos are located 150 feet from the ocean on the West Shore of Maui. WE HAVE TWO CONDOS NEXT TO EACH OTHER PLEASE SEE vrbo #752576 FOR VALLEY ISLE RESORT #402 "'Maui no ka oi" means 'Maui is the best' of the Hawaiian islands and the West coast is the best part of Maui. Sit on your private lanai and watch the whales play in the ocean in the winter or just enjoy the fabulous ocean and tropical gardens in the summer season. Conde Naste Traveler magazine voted Maui the best island in the world for years! Valley Isle has a beautiful beach, pool, BBQ, and is close to everything. Maui is just a casual collection of small towns with a peaceful way of life, car horns are only used to greet friends, posted store hours mean nothing if the surf is up and taking time to watch the sunset is a part of the daily routine. Even so, you will never be able to do all of the fun things that there are to do on Maui, from snorkeling in dormant volcanoes to swimming in the many waterfalls on the drive to Hana! The thrills are endless, any time of the year. Dressing room separate from bath and shower area. We have two bathroom sinks. Shower area is remodeled double shower with shower massage, regular shower head, rain shower and hand held. Long beach in either direction to walk. The ocean is shallow here for a long way out. Mostly sandy and fun to snorkel and swim or boogie board. Lahaina is the fun place to be anytime of day or night! Art stores, Friday night is Art Night, great shopping, and make sure you go under the Banyon Tree on the weekend for art shows. Beautiful West Maui Mountains are behind us. Check out our daily mountain rainbows in the late afternoon. extremely near the ocean!! Just down the elevator and out to the beach! Valley Isle Resort is one of the most requested Vacation Rentals on island due to the great value and great location! 401 & 402 are completely remodeled and have everything you need. Lahaina or as we refer to it, "Front Street" is a great place to go eat and shop. 50 steps to the ocean! Hi- internet/cable TV/DVD player/Netflix at no additional charge. Some toilet paper and kleenex provided. Guest may want to purchase more. Dish soap and dishwasher soap provided. Regular coffee maker. Normally there are filters included. Complete kitchen with everything you need. Washer and dryer in the kitchen also so pack lightly! Beach toys, usually bookie boards, sunbrellas, beach chairs. Occasionally these items go to the beach and stay there. I don't blame them! I like the beach too. Easy to purchase kitty corner. Both condos have large lanai's overlooking the ocean and 401 has second lanai off of bedroom. We refer to 'balconies' as 'lanai's' in Hawaii. Many types of boats to rent from catamarans to Kayaks, dinner cruises and my all time favorite whale watches. Also, take a Pacific Whale Foundation boat out to Molokini Crater and snorkel! Large lanai facing the ocean with 4 padded rattan chairs, table, two side tables, and ottomans! Large lanai overlooking gardens below and the ocean ! High-speed internet, heated Pool, free parking, no additional housekeeping charges, no hidden charges. Any activity (that does not involve snow) is available for on Maui! There are more activities than any other place in the world! We have it all! Or, just have a relaxing vacation and enjoy our condo, heated pool and our beach! Swim in waterfalls, hike along rivers, horseback-riding up the mountain and then along the ocean, or inside the dormant Haleakala crater! We have much art work and great stores on Front Street. Many art fairs with great stuff to look at or buy. Winery up the mountain and a lavender farm. Beautiful flower gardens to tour and golf the most beautiful courses along the ocean. Drive to Hana with a picnic lunch, there are coolers to use in the condos. Remember, it is the drive, not the destination on the road to Hana. You can't take a bad photo on Maui! Jet ski's when whales are not in season. Maui Ocean Museum is great too. Have too much fun! Loved it! I didnt want to leave! Had a great view from the lanai, fully stocked kitchen, nice pool and grilling area. Best part was watching the beautiful sunsets and listening to the waves crashing every night! We are so glad you enjoyed our condo and Maui! We hope you visit with us again! Beautiful rental, great views, good location, comfortable bed, loved staying here. I highly recommend renting this condo. Mahalo for your kind words! We do hope to see you again in the future! The condo was well equipped and the view from the bedroom and living area was beautiful! We are so glad you enjoyed our condo! We look forward to your return. We stayed at the Weston resort for 3 days then came to the valley isle to get away from the crowd. Is the perfect spot . The room is just a few steps from the sandy beach . The beach is perfect for snorkeling. The room is remodeled. The kitchen and bathroom is very nice. We stayed at valley isle in the past but this room was way better then the last. We will come again. We welcome you back anytime! This was a nice place to stay. Everything is updated, clean, plenty of towels, and slept well. Beautiful view from bedroom and lanai. I would recommend new pans for cooking. We were disappointed there was no boogie boards, and the sand bags on the beach. The no A/C in July was tough for part of our family. Thank you for a wonderful 4 day stay! Beautiful unit! Loved keeping the sliders open listening to the ocean. One of the girls I was with had the news on on our last night and I asked her to turn it off! I told her “ we could listen to it when we got home but not the ocean!” We did everything on our stay. Sunrise up at Haleakala, road to Hana, doors off helicopter,Luau, and ocean adventures rafting/ snorkeling. Yes, there are sandbags and beach isn’t the best but people were able to enjoy it. Hopefully I can come back to the same unit. Jan was so friendly and easy to work with. My only concern would be if any construction was going on! Love, Love Love Maui!! This unit was perfect right on the ocean!!!! Maholo! Hope to see you soon. We are so happy that you enjoyed yourselves! Thank you for your kind words. We will be building a restaurant, and it may start at the end of this year. Or not. Maui has its own timetable and fast is not part of it. We have no timetable yet. However, when we do build, the wing that 401 and 402 will have less noise than some other areas around then. It shouldn't be very loud, either way, and we have hours that they are allowed to operate. No one will be able to see it between us and the ocean. You would have to be outside the building to see it. We are not expecting it to be a very big deal though. Zip Line, Maui has more activities than any other place in the world! Don't forget world class snorkeling, diving, and the best golf courses anywhere. Don't forget driving through a rainforest and swimming in our many waterfalls. Hiking in Maui is so beautiful! You will see bamboo forests, hike next to or in waterfalls, through rain forests, and so much more. We have whale watches in the winter and the dolphins are always around. Do not forget your camera wherever you go! USA DOLLARS ONLY PLEASE: Our prices include housekeeping, include parking, include cable TV, including the Internet. We also have a second beautiful condo right next to this one. We take a 5-night deposit to confirm the reservation and the balance is due 30 days prior to arrival. Winter reservation balances are due November 1st of the year beginning that season. Winter reservations are 7 nights minimum unless there is a shorter time open on the calendar. We would take up to a 3 night stay in the winter under that circumstance. Summer stays of 3 nights or more. We do not refund, however, if we rebook the time that you have paid for we will refund that to you less any extra housekeeping charges or discounts and a $100.00 charge to cover our booking fees. You are welcome to pay through VRBO or HomeAway if you like. Also, we do not need you to pay for any insurance. We do not need you to insure the condos, they are well insured already. Aloha, Jan TAT = TA-041-904-5376-01 On island agents info on Condo Kitchen Table on check-in.